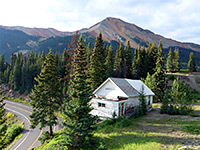 The high point of the spectacular, 80 mile section of US 550 through the San Juan Mountains is 11,018 foot Red Mountain Pass, named after the colorful, mineralized peaks that rise above the east side of the highway. 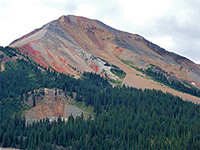 There are three distinct summits of Red Mountain, closest being 12,894 foot Number 3; Number 2 lies nearly mile north, and Number 1 two miles east. The red color is due to oxidized iron ore, though it was the associated silver, found in lengthy pipes, that was the target of mining activities here - mostly between 1882 and 1893, followed by sporadic excavations until the 1970s. Smaller amounts of copper, gold, lead and zinc were also obtained. The Red Mountain Mining District extends for over five miles, from the pass northwards to Ironton Park, a marshy, flat-floored valley 1,500 feet lower; at its peak the whole area included nearly 40 mines and six small towns; Albany, Congress, Chattanooga, Guston, Ironton and Red Mountain (the most populous), though little remains of any of these. 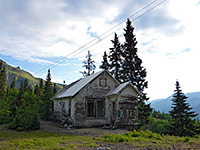 Some of the district is privately owned and not open to the public - in part due to dangerous structures and open shafts, and partly due to ongoing clean-up operations involving tailings ponds and streams - while other areas need a 4WD vehicle to explore. 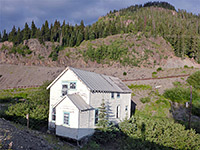 Much can be seen from the roadside, however, and there is one accessible area near the pass, beside Idorado Mine, the most recently-closed. 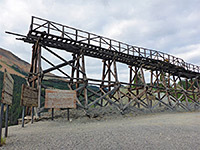 The main accessible relics here are a large wooden trestle, a tunnel entrance, and a group of wooden houses, all empty and partly ruinous, scenically situated between colorful, wooded slopes. 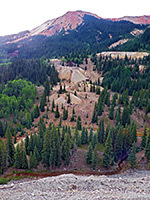 Approaching from the north (from Ouray), US 550 climbs steeply, in places via switchbacks, before flattening out around 9,600 feet at Ironton Park, at the north edge of the mining area. 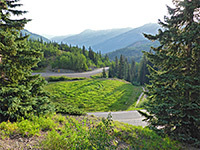 The upper (south) end of this valley is crossed by number of tracks and is a popular location for free, primitive camping, with space for dozens of vehicles, in clearings between the trees and beside meadows. Off to one side are the remains of the old settlement of Ironton, uninhabited since the last resident left in the 1960s. 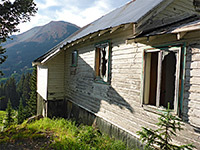 There are several wooden buildings in various stages of preservation, reached by a short drive along a dirt track. South of the flat area, the road climbs steeply again, curving through more sharp bends and passing through an area formerly used for tailings ponds, before reaching Idorado Mine shortly before the pass. A raised pull-out on the west side of the road affords good views of the surroundings, across to the heavily worked slopes at the foot of Red Mountain, site of the ghost town of Guston and dozens of mine openings, their positions marked by recent-looking, still unvegetated spoil heaps and a few surviving headframes, including that of the Yankee Girl Mine, a quarter of a mile east. Several notices give information about the nearby structures, which include the elevated trestle just below on the far side of the road - viewable close-up though fenced-off to prevent people climbing it - and the Treasury Tunnel, the entrance to which is a few hundred feet south. 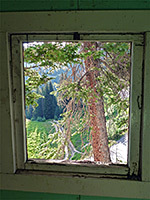 This connected to the Pandora Mill near Telluride, via adits and shafts that drop 1,500 feet - a horizontal distance of only 5 miles though 62 miles away by road. 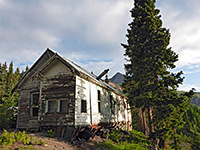 The most photogenic remains, however, are a group of early 20th century miners' houses, all made of wood, in a row extending a little way north of the pull-out. There are five mostly intact structures, one of two stories, the others ground floor only, plus a number of foundations. Four are unlocked and so can be entered, and still contain some furnishings and equipment. The outer surfaces were originally white, and the paintwork now has a pleasingly aged, weathered appearance, contrasting with the rich green of the surrounding grassland and trees, and the reds of the slopes above. 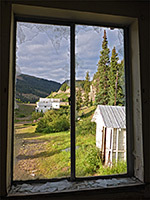 The location is evocative, just a little spoilt by the noise of vehicles climbing up the adjacent highway. South of Idorado Mine the mining district continues another mile, ending just beyond Red Mountain Pass as the road starts its descent towards Silverton. Two tracks fork west just below the pass, one over the mountain crest to Telluride (via Black Bear Pass), the other to Porphyry Basin.